We love coming across stories of human kindness. That’s why we were so pleased to have found out about Amanda Cartagine. Amanda is a valued member of the community and she’s also a business owner and a mother to a special needs child. One day, in her restaurant, Pizza Inn, Amanda found out that a customer had been harassing one of her employees. She decided to inquire and find out more about the incident. For most companies and businesses, the phrase “the customer is always right” is one that gets thrown around a lot. When Amanda heard what happened inside her restaurant, she was shocked and appalled. A customer had been verbally assaulting one of her workers with special needs. She was disgusted that somebody could belittle and embarrass her work family so she decided to take action. Amanda Cartagine is a mother to a child with down syndrome so she knows that those with special needs just need a little more time to master a task. They’re not ‘useless’, they can get tasks done and they do it with a smile and charm. 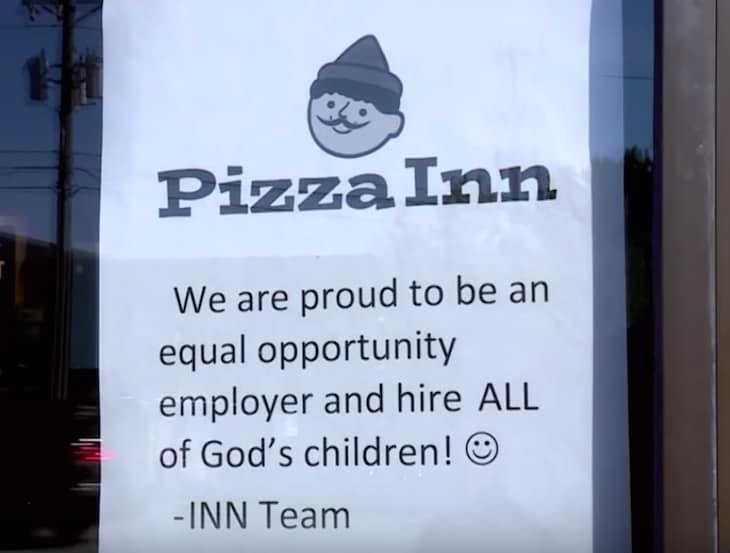 In fact, her son was the inspiration for hiring a large number of disabled people to work at her Pizza Inn restaurant. We parents with special needs (children) are always faced with breaking down barriers, stigmas, teaching other people that our children are more like them, than different. If you have the patience to let them take their time and learn at their pace, when the light bulb comes on, they are unstoppable. The customer had asked an employee with autism to refill a lettuce bowl in the salad area. But this was something the boy wasn’t trained to do. Each member of staff at the Pizza Inn has a specific responsibility and they’re only asked to manage their own individual tasks. However, this customer refused to accept Amanda’s unique way of doing business. So he began to belittle the employee, the manager and others in the building. My manager explained to him the situation privately, ‘That’s not his job. We’ve trained him to do this and there are special circumstances,’ and the customer was still not happy. 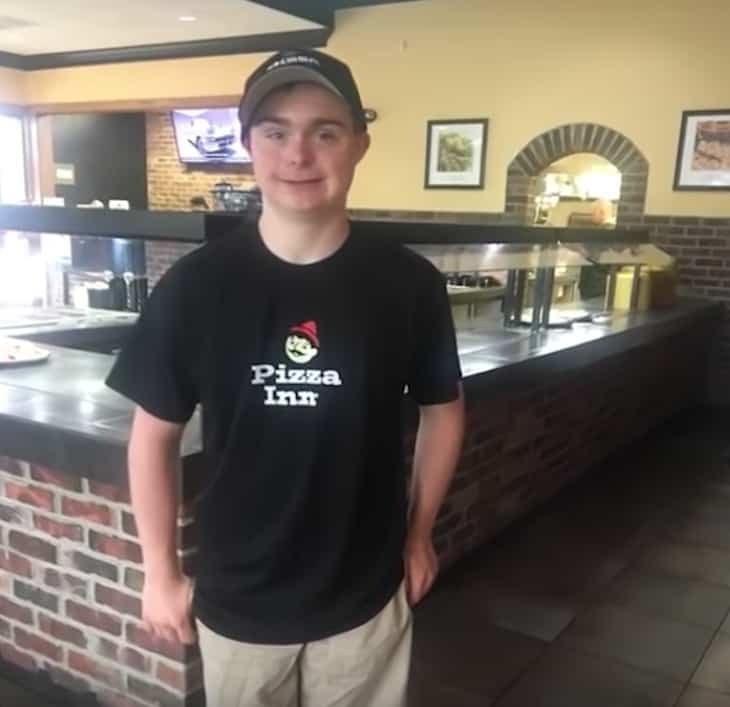 Before the man left the restaurant, he shouted saying that Pizza Inn should hang a ‘warning’ sign to let other people know that the restaurant has a lot of disabled employees. We are proud to be an equal opportunity employer and hire all of God’s children. She wanted people to know that she fully supports her employees and that she will gladly employ more disabled people. The world is a cruel place and Amanda just wants to spread a bit more happiness and understanding. These are like my kids, and it made me angry. I wanted to do something that was not rude, but got my point across.